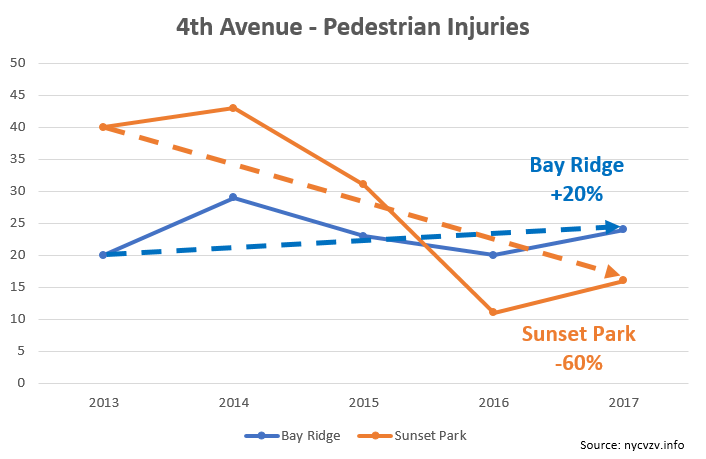 An analysis of data from the NYC Vision Zero web site by Hey Ridge shows pedestrian injuries on Bay Ridge’s Fourth Avenue have risen since Community Board 10 rejected the key safety measures proposed by the department of transportation in 2013. Injuries on the avenue rose 20 percent, to 24 injuries in 2017 from 20 injuries in 2013. Pedestrian injuries in Sunset Park, whose community board endorsed the DOT’s proposal, fell 60 percent, to just 16 injuries in 2017 from 40 in 2013 . Total injuries (pedestrian, cyclist and motorist or car/truck occupant) in Bay Ridge are down 29 percent since 2013. But again, the rate of improvement here is vastly outpaced by the one seen in Sunset Park, where injuries are down 51 percent since 2013. 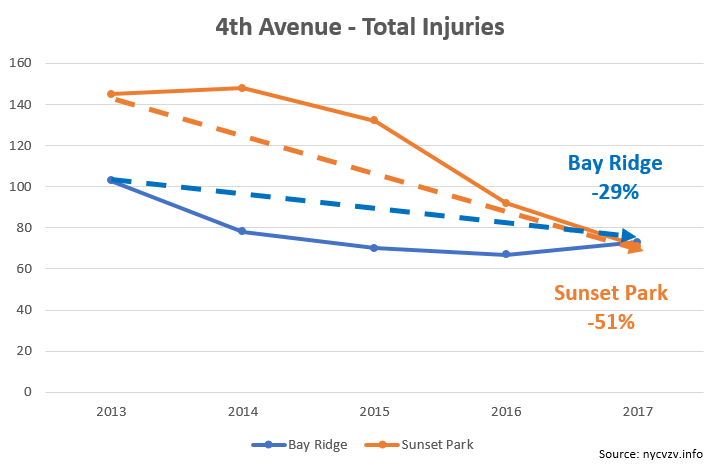 There haven’t been any fatalities on Bay Ridge’s stretch of Fourth Avenue since 2013. Click here for additional notes regarding NYC injury data. The department of transportation started planning work on improving safety along the entire length of Brooklyn’s Fourth Avenue in 2010, which had earned a reputation similar to the Queens “Boulevard of Death” (which has seen its own safety renaissance). Although a number of safety features were to be introduced, the key aspect was a reduction of travel lanes to discourage speeding and reduce injuries. In Park Slope and Sunset Park, Fourth Avenue was to be reduced from six lanes to four. 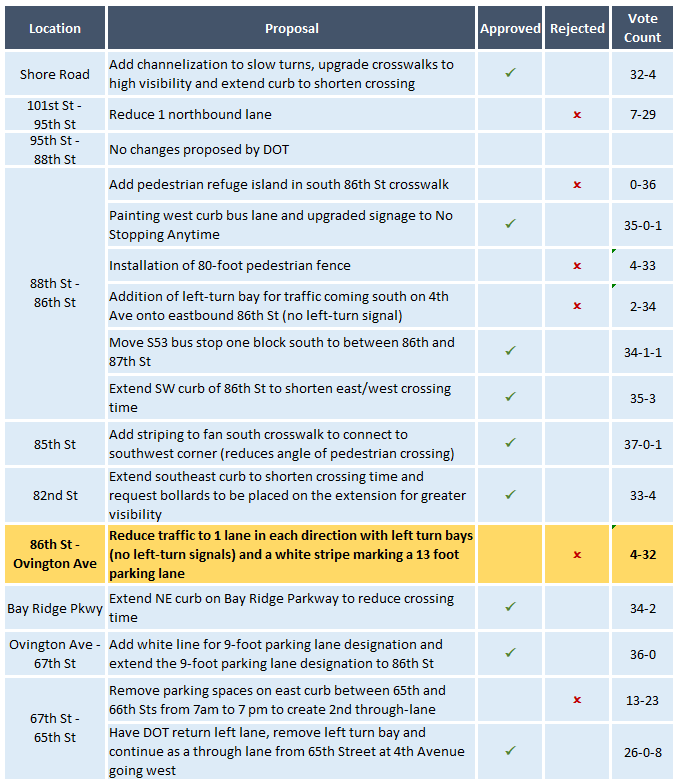 Most of the Bay Ridge segment down to 86th Street was to be reduced from four lanes to two, with left-turn bays. The DOT presented its proposal to the individual community boards. CBs 6 and 7 endorsed the plan for Park Slope and Sunset Park. In Bay Ridge, Community Board 10 decided to vote on each individual aspect separately. 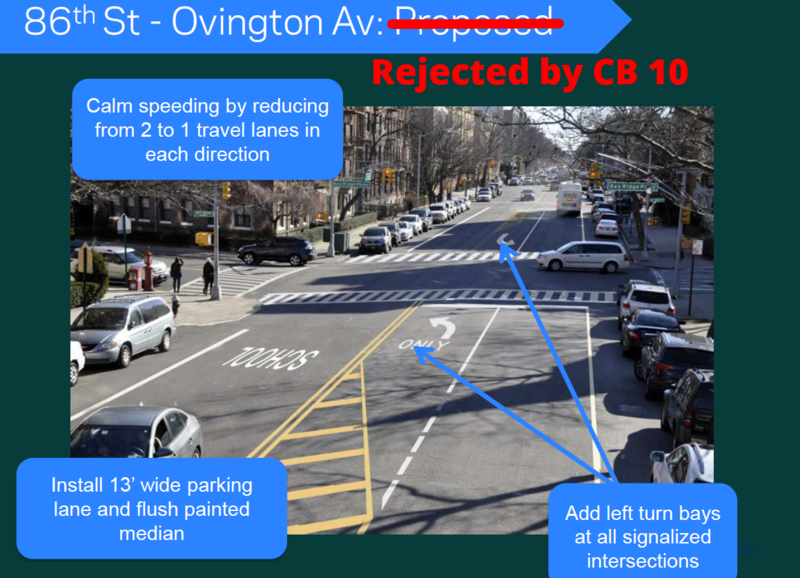 CB10 was supportive of a number of small-bore proposals, such as high-visibility crosswalks, but overwhelmingly rejected the lane reduction. The lane reduction from Ovington Avenue to 86th Street was supported only by Andrew Gounardes, Rita Meade, Bob HuDock and a fourth board member (the names aren’t in the minutes, and I unfortunately don’t remember). Gounardes, Meade and HuDock have all since left the community board. Thirty people that were board members in October 2013 (out of a total 50) are still board members today. In October 2013, Community Board 10 supported a number of small-bore improvements, but rejected the one that mattered most. Bay Ridge – where no one likes change even if it’s for the good of every single person living in the neighborhood. I wish the CB was properly educated on the effects on lane reductions. They, like most lay people, just think, “if you remove lanes, we’ll get endless congestion” but that simply isn’t what happens. Then again, I don’t know if it’s possible for those fossils on the CB to possibly learn anything at all. The names aren’t in the minutes? Are they somewhere else? The New York State Public Officers Law requires a record of how each member voted. Gounardes should know this better than most people.